A new study, led by geologist Gregory J. Retallack of the University of Oregon, now has presented evidence for life on land that is four times as old—at 2.2 billion years ago and almost half way back to the inception of the planet. That evidence, which is detailed in the September issue of the journal Precambrian Research, involves fossils the size of match heads and connected into bunches by threads in the surface of an ancient soil from South Africa. They have been named Diskagma buttonii, meaning "disc-shaped fragments of Andy Button," but it is unsure what the fossils were, the authors say. 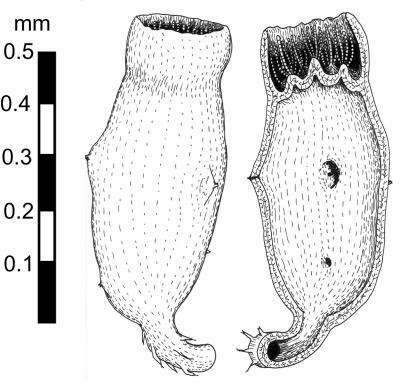 The images enabled a three-dimensional restoration of the fossils' form: odd little hollow urn-shaped structures with a terminal cup and basal attachment tube. "At last we have an idea of what life on land looked like in the Precambrian," Retallack said. "Perhaps with this search image in mind, we can find more and different kinds of fossils in ancient soils." The new fossil, the authors concluded, is a promising candidate for the oldest known eukaryote —an organism with cells that contain complex structures, including a nucleus, within membranes. I guess it makes sense that life would have branched out from the ocean onto land multiple times throughout the Earth's history and not made it in the long term each time. Cool that it could have happened so early. Don't mind Retallack. He is fringe and known for his pushing early land life on erroneous interpretation of cryptic mineral formations. The other fossil doesn't seem to exist either. The latest genetic modeling puts the mitochondrial endosymbiosis, indicative for surviving eukaryotes, at ~ 1.2 Ga bp [billion years before present] and plasmid endosymbiosis, indicative for algae and plants, at 0.9 Ga bp (Matzke et al, 2013). Personally I seriously doubt eukaryotes appeared before cyanobacteria, which through a first ever phylogeny could be dated to just before the OE (Oxygenation Event of Earth) at ~ 2.5 Ga bp. Not because a mitochondrial metabolism demands an oxygenated environment. But because Bacteria and Eukaryotes split about the same time, cyanobacteria diverged among the major early bacterial divergence, and the first eukaryote specific sterane trace fossils are ~ 2 Ga bp. [cont] There are many reasons geological and biological why complex multicellular life didn't appear on land until ~ 0.5 Ga bp. Among others, multicellulars aren't much older. Even the most optimistic molecular clocks puts animals at ~ 0.7 Ga bp, plants see above, and the first respective fossils appears some time after that.